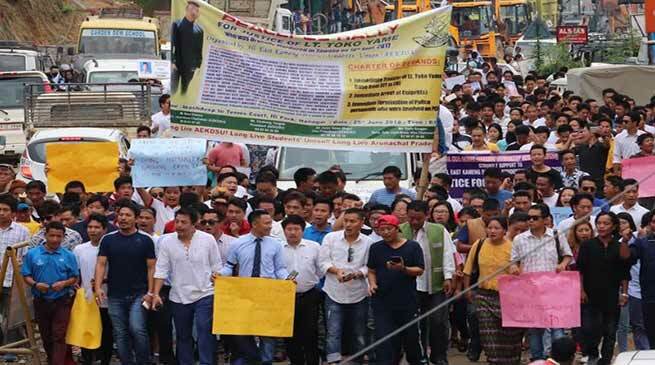 The All East Kameng District Students Union (AEKDSU) organised a protest march in Itanagar in support of their demands of immediate transfer the Late Toko Yame case from SIT to CBI, immediate arrest of culprits involved and immediate termination of police personnel who were on PCR duty then. The rally was stared from Akashdeep and culminated at the Tennis Court at IG Park. Addressing the gathering AEKDSU General Secretary Nera Gamro said that the incident which took place in September last year where Late Toko Yame have lost his life, but no arrest have been made so far. It is almost Nine month completed but no specific action have been so far seen on the ground and no justice have been delivered to Late Toko Yame and his family members neither no compensation have been paid so far, he added. The action of the SIT is not predicted and we may have to continue to wait for justice and proper investigation, we are not at all satisfied with pace of investigation as till days no Charge Sheet have been filed, no one have been arrested and no action have been initiated against the police personnel who were there in the case at that time, Gamro added. Gamro further said that ” we want only CBI enquiry which would unearth the truth, until justice is delivered we shall continue with the movement ” . Several students leaders and other address the rally and in one word demanded shifting of case from SIT to CBI and threatened to mass movement for the justice.